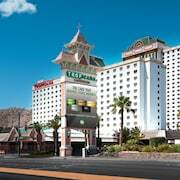 Lots more than gaming awaits guests at the Tropicana Express Hotel & Casino on the Laughlin Strip. The hotel includes an outdoor pool with poolside jumbo TV. There are adults-only swim hours. 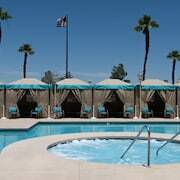 Cabanas are available (surcharge), as is poolside food and beverage service. The Pavilion Theater hosts entertainment from hilarious comedians to big name entertainers. 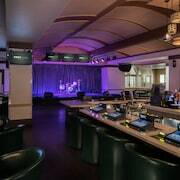 The Trop Lounge offers free entertainment serving up the hottest bands. Complimentary valet and self-parking are available in a secure garage and outdoors. A full service business center and meeting rooms are on site. Wireless Internet access is complimentary in the public areas. 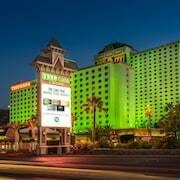 Situated in sunny Laughlin about a block from the Colorado River, this 1,495 room resort features a round-the-clock casino, nightly entertainment, and several restaurants, including a steakhouse and buffet. 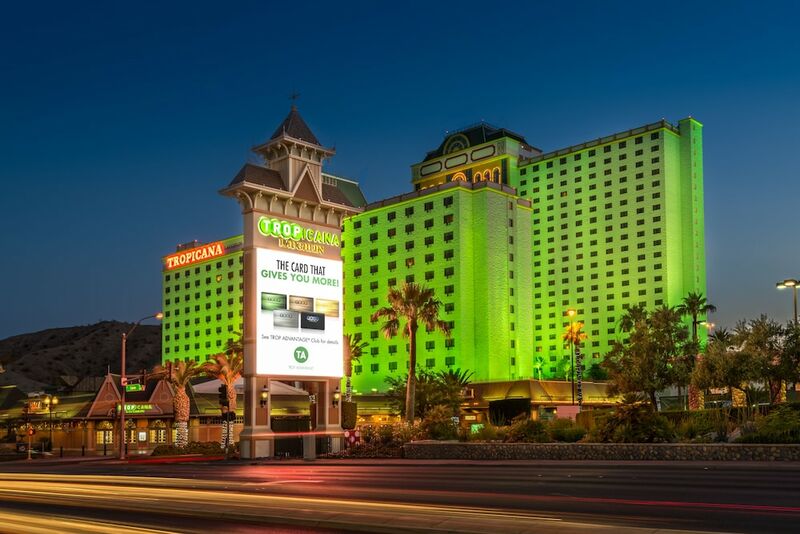 Tropicana Express Hotel & Casino's pool has a jumbo screen and Bose surround-sound, perfect for movie-watching, music videos, and sport events. The Poolside Café and Malibu Bar serves up cocktails and sandwiches close by. All guestrooms offer air conditioning, direct-dial phones, and TVs. Bathrooms are outfitted with a combination of shower and tub. WiFi is available for a surcharge. 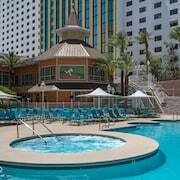 Tropicana Laughlin offers 1487 air-conditioned accommodations with hair dryers and complimentary toiletries. Cable television is provided. Bathrooms include shower/tub combinations. 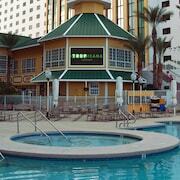 This Laughlin resort provides wireless Internet access for a surcharge. Refrigerators and irons/ironing boards can be requested. Housekeeping is provided daily. The Steakhouse Restaurant - Open for dinner, this venue serves steak and seafood. 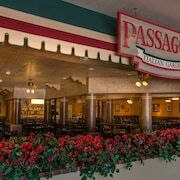 Passaggio Italian Garden - Open for dinner, this restaurant serves pizza and pasta. 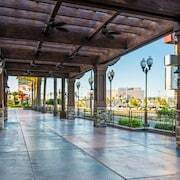 Roundhouse Buffet - This restaurant serves breakfast and dinner buffets. Poolside Cafe - Offers sandwiches and baked items. Carnegie's Café - This restaurant serves breakfast, lunch, dinner and late-night dining, open 24 hours. Dip & Dogs - Enjoy some of your summertime favorites, including Nathan’s Famous Hot Dogs and Thrifty’s Ice Cream. Taqueria Del Rio - Authentic Mexican cuisine is served at affordable prices. Eclipse Bar - This celestial-themed bar with a unique ceiling that morphs into a kaleidoscope of colors has exotic drinks, video poker machines, and plasma TVs. Tango's - Come here for live entertainment nightly with no cover charge and no minimum. There are also dancing and casino games. 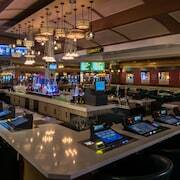 Grand Junction Premium Slot Lounge and Bar - Located in the casino, this bar serves 31 “flavors” of martinis, as well as wine, premium drinks, and full service. The Pavilion Theater - Entertainment, from comedians to big-name entertainers. 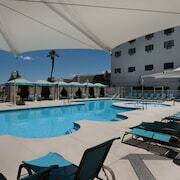 Rollaway/extra beds are available for USD 15.00 per stay.